Democratic Rep. Sheila Jackson Lee (Texas) scrubbed pictures of herself on location at Super Bowl LI following a Washington Free Beacon report on the congresswoman using campaign funds for tickets to the event. The Free Beacon reported last week that Jackson Lee's campaign made two separate transactions totaling nearly $10,000 for Super Bowl tickets from her campaign funds for the Feb. 5 championship game between the Atlanta Falcons and New England Patriots that was held at NRG Stadium in Houston, Texas. Three days before the event, Jackson Lee's campaign disbursed $4,900 to 21st Century Fox for Super Bowl tickets. A second transaction was made days after the game when Jackson Lee's campaign reimbursed Gerald Womack, her campaign manager, $4,900 for tickets. The campaign also spent $4,900 on the day of the Super Bowl at an Italian restaurant in Houston. Weeks after the event, a Maryland-based political consulting firm was paid $250 for Super Bowl invites from the campaign. Jackson Lee was shown to be in Houston at least one week before the game. Ellis Wyms, a former player for the Tampa Bay Buccaneers, posted a photo with Jackson Lee on Twitter at a Super Bowl Kickoff event where Jackson Lee can be seen wearing a "VIP preview" badge. 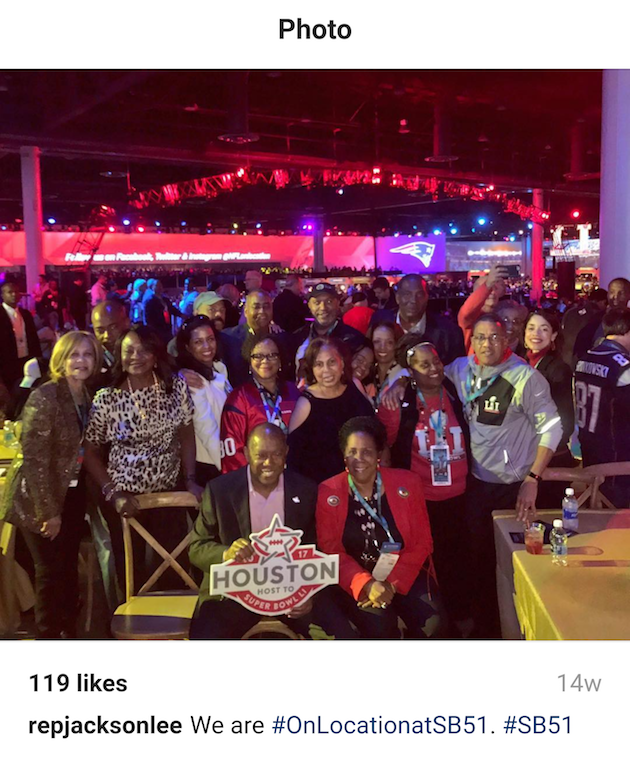 On the day of the event, Jackson Lee posted a photo of herself "on location" at NRG Stadium for Super Bowl LI to her Instagram account. However, following publication of the report last week, Jackson Lee has since deleted the photo from her account, which now displays the message, "Sorry, this page isn't available." 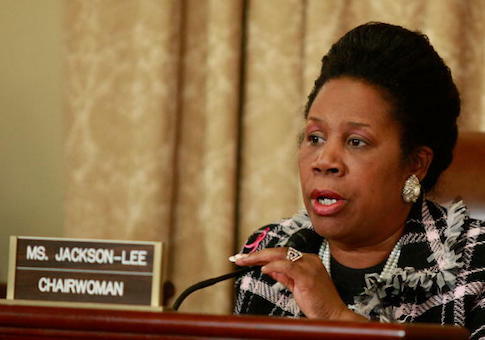 Matthew Whitaker, president of the Foundation for Accountability and Civic Trust, a D.C.-based government accountability group, told the Free Beacon that Jackson Lee owes an explanation on the the expenditures. Members of Congress are prohibited from using campaign funds for personal use. Both Jackson Lee's campaign and congressional office never returned requests for comment on the tickets.